Epiphanie Mukashyaka is an amazing woman. The first time you meet her, it is clear she is a person of great strength, determination and vision. Her story is an incredibly sad but inspirational one that has touched and transformed the lives of many in her community, and demonstrates the resilience of the human spirit in the face of tragedy. In 1994, Epiphanie tragically lost her husband, a child, and an entire hillside of extended family to the Rwandan genocide that claimed nearly a million lives in 100 days. Widowed and grieving, Epiphanie was faced with the responsibility of caring for her seven surviving children and rebuilding their lives. With a limited education, and little money or support, Epiphanie turned to the coffee trees left behind by her husband to find a way to survive as a farmer. In addition to harvesting and selling the cherries from her farm, Epiphanie used the small amount of capital she had to buy other farmers’ cherries, and sold them on the internal market. The years that followed were tough, with prices at an all-time low and many farmers abandoning coffee for other crops. 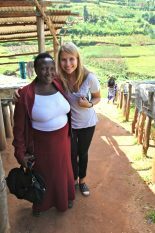 In 2000, Epiphanie came across the Partnership to Enhance Agriculture in Rwanda through Linkages (PEARL) initiative, which aimed to create better economic opportunities for farmers by establishing the foundations for a future of specialty coffee production in Rwanda. Epiphanie learnt from Tim Shilling, PEARL’s director, that she could gain better prices by improving the quality of her coffee. Armed with this knowledge, Epiphanie applied for a loan from the Rwandan Development Bank, and established a family-owned company, which she called Buf Cafe (after the name of the region at the time, Bufundo). From PEARL, Epiphanie learnt how to improve coffee quality through better cherry selection, processing, and sorting. She set about engaging and training local farmers and encouraged them to supply her with better quality cherries in exchange for better prices, which she then onsold at premium prices to washing stations. In 2003, after careful management of her first loan, Epiphanie was granted credit to build a coffee washing station. She established Nyarusiza washing station and, after a number of years of impressive growth, she was able to open a second washing station – Remera – in 2007. Buf Cafe has since done a massive amount to rebuild the surrounding community – helping to bring electricity and water to the local town and providing jobs, income, and a central focus to thousands of people. Today Epiphanie buys cherries from as many as 7000 smallholder farms in the surrounding area, making her the largest employer in her local community. Some of these farmers are also employed to work at Buf’s two washing stations, where they are paid a premium above the local average wage. The idea is that well-paid workers are more likely to care about their jobs and take pride in the quality of Buf’s coffee. And this approach is working. Today, Buf café is recognized for its exceptional quality, with an array of impressive and well-deserved awards, including the Golden Cup in 2007, and Cup of Excellence in 2008, 2010, and 2011.